From grubby packaging that engulfs small Southeast Asian communities to waste that piles up in plants from the US to Australia, China’s ban on accepting the world’s used plastic has thrown recycling efforts into turmoil. For many years, China took the bulk of scrap plastic from around the world, processing much of it into a higher quality material that could be used by manufacturers. But, at the start of 2018, it closed its doors to almost all foreign plastic waste, as well as many other recyclables, in an effort to protect its environment and air quality, leaving developed nations struggling to find places to send their waste. “It was like an earthquake,” Arnaud Brunet, director general of Brussels-based industry group The Bureau of International Recycling, said. Instead, plastic was redirected in huge quantities to Southeast Asia, where Chinese recyclers have shifted. With a large Chinese-speaking minority, Malaysia was a top choice for Chinese recyclers looking to relocate, and official data showed plastic imports tripled from 2016 levels to 870,000 tonnes last year. 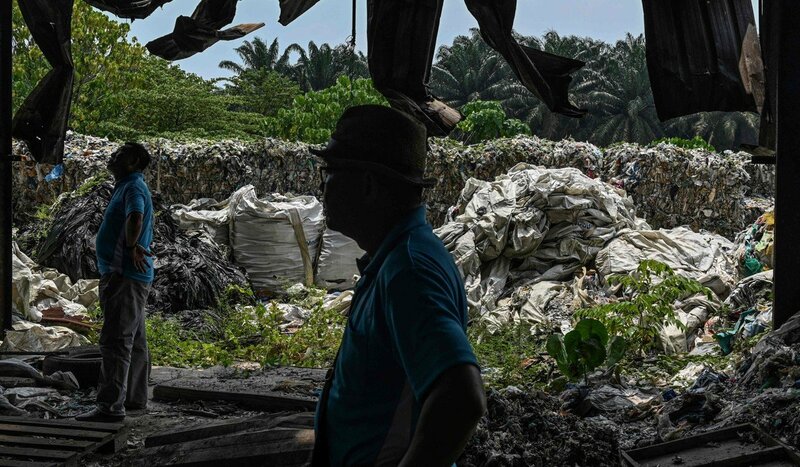 In the small town of Jenjarom, close to Kuala Lumpur, plastic processing plants appeared in large numbers, pumping out noxious fumes around the clock. Huge mounds of plastic waste, dumped in the open, piled up as recyclers struggled to cope with the influx of packaging from everyday goods, such as foods and laundry detergents, from as far afield as Germany, the US, and Brazil. Residents soon noticed the acrid stench over the town – the kind of odour that is usual in processing plastic, but environmental campaigners believed some of the fumes also came from the incineration of plastic waste that was too low quality to recycle. “People were attacked by toxic fumes, waking them up at night. Many were coughing a lot,” resident Pua Lay Peng said. “I could not sleep, I could not rest, I always felt fatigued,” the 47-year-old added. Pua and other community members began investigating and, by mid-2018, had located about 40 processing plants, many of which appeared to be operating without proper permits. Initial complaints to authorities went nowhere but they kept up pressure, and eventually the government took action. Authorities started closing down illegal factories in Jenjarom, and announced a nationwide temporary freeze on plastic import permits. Thirty-three factories were closed down, although activists believed many had quietly moved elsewhere in the country. Residents said air quality had improved but some plastic dumps remained. In Australia, Europe and the US, many of those collecting plastic and other recyclables were left scrambling to find new places to send it. They faced higher costs to have it processed by recyclers at home and in some cases resorted to sending it to landfill sites as the scrap piled up so quickly. “Twelve months on, we are still feeling the effects but we have not moved to the solutions yet,” said Garth Lamb, president of industry body Waste Management and Resource Recovery Association of Australia. Some have been quicker to adapt to the new environment, such as some local authority-run centres that collect recyclables in Adelaide, South Australia. The centres used to send nearly everything – ranging from plastic to paper and glass – to China but now 80 per cent is processed by local companies, with most of the rest shipped to India. 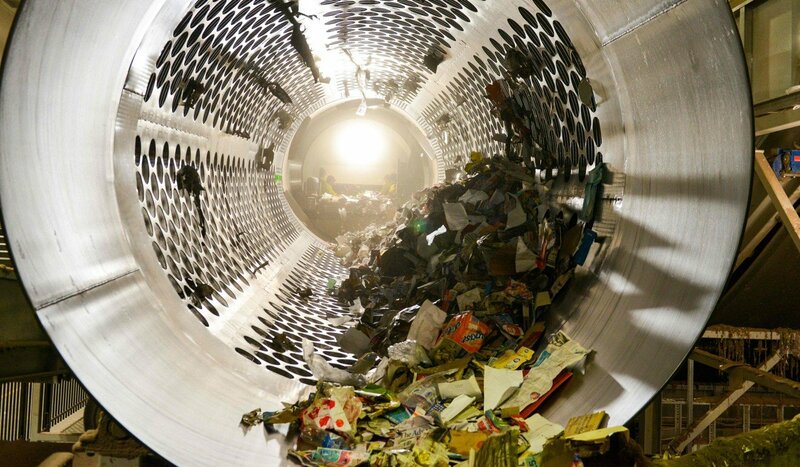 “We moved quickly and looked to domestic markets,” Adam Faulkner, chief executive of the Northern Adelaide Waste Management Authority, said. In mainland China, imports of plastic waste dropped from 600,000 tonnes per month in 2016 to about 30,000 a month in 2018, according to data cited in a recent report from Greenpeace and environmental NGO Global Alliance for Incinerator Alternatives. Once bustling centres of recycling were abandoned as firms shifted to Southeast Asia. On a visit to the southern town of Xingtan last year, Chen Liwen, founder of environmental NGO China Zero Waste Alliance, found the recycling industry had disappeared. “The plastic recyclers were gone – there were ‘for rent’ signs plastered on factory doors and even recruitment signs calling for experienced recyclers to move to Vietnam,” she said. Southeast Asian nations affected early by the China ban – as well as Malaysia, Thailand and Vietnam were hit hard – have taken steps to limit plastic imports, but the waste has simply been redirected to other countries without restrictions, such as Indonesia and Turkey, the Greenpeace report said. With only an estimated nine per cent of plastics ever produced recycled, campaigners said the only long-term solution to the plastic waste crisis was for companies to make less and consumers to use less. BEIJING (Reuters) – China’s Ministry of Foreign Affairs said on Tuesday it has lodged representations with the United States over its decision to end waivers on sanctions on Iranian oil imports. China is Iran’s largest crude oil customer, with total imports last year of 29.27 million tonnes, or about 585,400 barrels a day, roughly 6 percent of China’s total oil imports, according to customs data. “The decision from the U.S. will contribute to volatility in the Middle East and in the international energy market,” Geng Shuang, a ministry spokesman, told a news briefing. 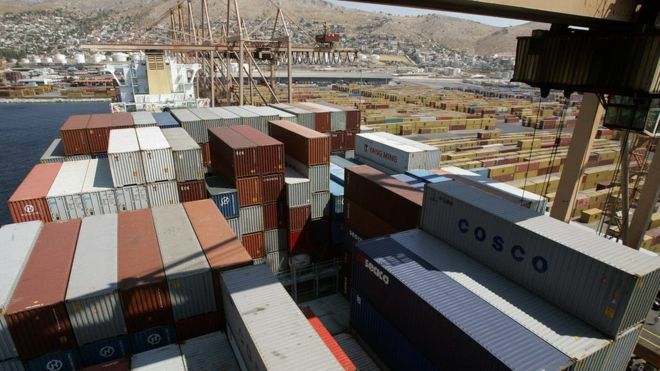 Washington has announced that all Iran sanction waivers will end by May, causing crude oil prices to rise and pressuring importers to cut their Iranian imports to zero. China was one of eight global buyers that won exemptions to import crude oil last November. Some of China’s key refineries are configured to process the Iranian crude and refinery officials say Iranian oil typically yields better margins compared similar grades from rival suppliers such as Saudi Arabia. State-owned Sinopec Group and China National Petroleum Corp both produce oil in Iran, having spent billions of dollars on oil fields such as Yadavaran and North Azadegan. They have been sending the oil from the fields to China. Co-organized by the Prince Kung’s Palace Museum in Beijing and provincial and municipal authorities in Shaanxi, the event will also include academic forums and performances of intangible cultural heritage music, dances, and Chinese operas. Shadow play, also known as shadow puppetry, dates back to the Han Dynasty around 2,000 years ago. Performers hold cowhide-carved figures between a source of light and a translucent curtain, make movements of the figures for storytelling, and add drum sounds and Chinese opera to accompany the movements. Chen Xiaowen, the deputy curator of the museum, said at a press conference in Beijing that they will try to organize more state-level shadow play events in Weinan and establish a special committee for the art form in the city. BEIJING, April 21 (Xinhua) — Chinese President Xi Jinping and Premier Li Keqiang on Sunday sent condolence messages to their Sri Lankan counterparts, respectively, after multiple deadly attacks shook the country. In his message to Sri Lankan President Maithripala Sirisena, Xi said that he was shocked to know the series of explosions in Sri Lanka, which have caused large casualties. “I, on behalf of the Chinese government and people, as well as myself, send my deep condolences to the victims, and my sincere sympathy to the injured and families of the victims,” he added. The Chinese government and people will firmly stand by the people of Sri Lanka and firmly support the Sri Lankan government’s effort to maintain national security and stability, Xi said. On the same day, Chinese Premier Li Keqiang also sent condolences to Sri Lankan Prime Minister Ranil Wickremesinghe over the attacks. KUNMING, April 21 (Xinhua) — China has lifted three ethnic minority groups out of poverty in the southwestern province of Yunnan as it steps toward delivering the goal of completely eliminating poverty by 2020. The ethnic minority groups of Dulong, Deang and Jino had a total population of more than 50,000, according to the last national population census in 2010. The proportion of residents living in poverty has been reduced from 24.25 percent a few years ago to 2.42 percent, well below the required 3 percent that removes them from the poverty list in western China. The ethnic minority groups of Dulong, Deang and Jino live in the mountainous regions in the northwestern, western and southern parts of Yunnan, respectively. Huang Yunbo, head of the provincial office of poverty alleviation and development, said a total of seven ethnic minority groups will be removed from the poverty list this year. The number of such ethnic groups who are lifted out of poverty will reach 11 by 2020, Huang said. The battle against poverty is one of the “three tough battles” that the country must win to build a moderately prosperous society in all respects by 2020. To achieve the goal, China needs to lift around 30 million poor rural residents out of poverty between 2018 and 2020. At least 290 people were killed and more than 500 others injured in the blasts, according to a Sri Lankan government official on Monday, who said a local militant group was behind the attacks. The Chinese embassy in Colombo had contacted the families of the two deceased Chinese and was awaiting police confirmation on the fate of the five still missing, state-run People’s Daily reported. Two Chinese nationals sustained serious injuries in the blasts and three others minor ones. Embassy officials had visited them several times in hospital, the report said. “The embassy will closely monitor the situation, urge Sri Lankan police to confirm the whereabouts of the missing persons and assist Chinese citizens and families to properly handle the aftermath,” the embassy was quoted as saying. The two Chinese who died, cousins surnamed Tan, were caught in a blast at the Shangri-La Hotel in Colombo, Red Star News quoted a Chinese businesswoman in the Sri Lankan capital as saying. “Their families identified them at the scene,” she said. Four of the missing Chinese – Li Dawei, Li Jian, Pan Wenliang and Wang Liwei – are students from the Ministry of Natural Resources’ First Institute of Oceanography who were going to take part in a study in the Indian Ocean, an institute staff member told Red Star News. Four of the five injured are students from the Chinese Academy of Sciences’ South China Sea Institute of Oceanology, who were en route to a study trip in the eastern Indian Ocean. Tourists who returned to Shanghai and Chengdu, Sichuan province, told the newspaper that their trip had to be cut short as shops were closed and a curfew imposed amid tight security. “All the private cars, coaches, vans and buses had to open their doors for inspection. There were checkpoints every 10 metres,” said one tour guide from Chengdu. A traveller from the same city said airport security had also been stepped up. “There was a bombing 20 minutes after we left a restaurant and another one outside the airport when we were waiting there. We had to pass through three or four very strict security checks at the airport,” she said. Tesla said it is investigating a video on Chinese social media that appears to show one of its vehicles bursting into flames in Shanghai. In a statement, the carmaker said it had sent a team to investigate the matter, and that there were no reported casualties. The video, which has not been verified by the BBC, showed a stationary car erupting into flames in a parking lot. 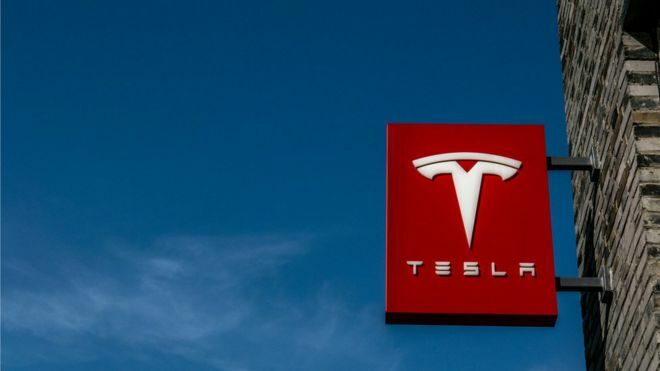 Tesla did not confirm the car model but social media identified it as Model S.
“After learning about the incident in Shanghai, we immediately sent the team to the scene last night,” according to a translation of a Tesla statement posted on Chinese social media platform Weibo. The video showed smoke rising from a parked, white vehicle and seconds later it bursts into flames. The time stamp on the video shows the incident happened on Sunday night, local time (Sunday morning GMT). Previous incidents involving Tesla vehicles catching on fire seem to have happened while the cars were moving. In 2018, a Tesla car driven by British TV director Michael Morris burst into flames, following another such incident involving a Model S model in France in 2016. A series of fires involving Tesla Model S cars took place in 2013. CLAREMONT, the United States, April 20 (Xinhua) — Chinese and American scholars called on the two countries and the rest of the world to strengthen cooperation on ecological civilization at an international forum, which kicked off here on Friday in western U.S. state of California. 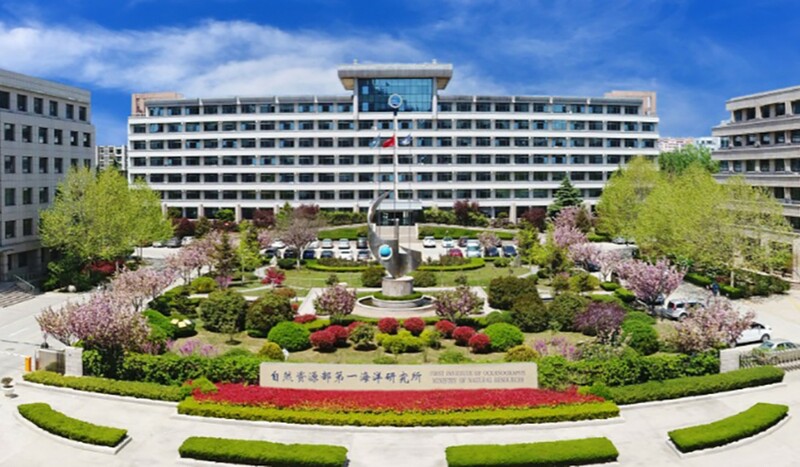 Themed “Ecological Civilization and Holistic Human Development,” the forum is hosted by the Institute for Postmodern Development of China, a U.S. think tank and non-profit organization. Over 160 scholars from China, the United States and other countries are exchanging views on the latest developments in ecological civilization at the Pitzer College in the two-day event. “Let’s work together to create an ecological civilization,” said John B. Cobb Jr., a 94-year-old member of the American Academy of Arts and Sciences in his welcome remark at the opening ceremony. “I have said many times that my hope for the future of process thinking is in China,” said Cobb, noting that China is now far in the lead in the development of ecological civilization. Cobb has been advocating for green development and more efforts to avoid global ecological crisis since 1970s. “More and more, we want to learn from you and to share our ideas with you,” he told Chinese scholars in his speech. He noted that China has adopted the goal of ecological civilization and changed policies accordingly. Cobb is the author of more than 50 books and the founding president of the Institute for Postmodern Development of China, donating all of his money to support its operation and activities. He said that China’s commitment to become an ecological civilization has inspired some cities in other countries and expressed hope for more cooperation between China and the United States in future. “I hope that, as citizens and local communities, we can continue to build ties of friendship and mutual support,” Cobb concluded. Philip Clayton, president of the Institute for Postmodern Development of China, urged China and western countries to jointly deal with climate change. “China became the global leader in the development of ecological civilization in 2007. China has begun to bring attention to ecological civilization in the United States, and many western countries inspired by that movement,” Clayton told Xinhua. The Chinese government announced its first national action plan to respond to climate change in 2007, becoming the first developing country to formulate and implement the National Climate Change Program. Respect nature, follow its way and protect it. The Chinese leadership has been tirelessly promoting a simple, moderate, green, and low-carbon life for Chinese people, and asked them to treat the ecological environment with the same importance they treat their own lives. “We have begun an annual series of international forums on ecological civilization that helps the west learn about Chinese ideas of ecological civilization. We are at a phase of new partnership opening up between China and western nations like the United States,” said Clayton, adding that as the environmental crisis grows greater, the room for cooperation is much more expanded. “This is a really important time in the history of our planet. We have an increasingly short amount of time in order to be able to take real, concerted effort to address the climate crisis, and our countries have an opportunity to collaborate and cooperate to reduce the impact of industry and agriculture in order to form the ecological civilization,” said Brian G. Henning, Professor of Department of Environmental Studies at the Gonzaga University. “It’s clear to us now that no country will be unaffected by the changes to our climate. I live in Washington State and the wild fires each year are getting worse and worse. And this is causing people all over our country to realize that we need to take climate change seriously and to reduce the carbon pollution in our environment,” he added. Some Chinese scholars introduced the latest development of China’s ecological civilization construction, emphasizing the importance and necessity of cooperation in the field. In her plenary speech, Dr. Fan Meijun, program director of Institute for Postmodern Development of China, argued that new education model is urgently needed to cultivate persons who serve the local community, serve the ecological civilization. Fan stressed that ecological civilization is a huge project which needs countries to work more in-depth cooperation. “In this sense, the cooperation between China, the second largest economy, and the United States, the largest one, is extremely important,” she noted. The European Union has introduced a new mechanism for screening foreign investment. It’s widely believed to have been prompted by concerns over China’s economic ambitions in Europe. It will allow the European Commission – the EU’s executive arm – to give an opinion when an investment “threatens the security or public order” of more than one member state or undermines an EU-wide project such as the Galileo satellite project. In March, the European Commission called China a “systemic rival” and a “strategic competitor”. The Chinese Ambassador to the EU urged the bloc to remain “open and welcome” to Chinese investment, and not to “discriminate”. How much foreign investment is in the EU? China’s ownership of EU businesses is relatively small, but has grown quickly over the past decade. A third of the bloc’s total assets are now in the hands of foreign-owned, non-EU companies, according to a report from the European Commission in March. Of these, 9.5% of companies had their ownership based in China, Hong Kong or Macau – up from 2.5% in 2007. That compares with 29% controlled by US and Canadian interests by the end of 2016 – down from nearly 42% in 2007. So, it’s a significant increase, but the total amount is not huge, comparatively speaking. Foreign direct investment into the 28 member stAlthough the levels of Chinese foreign direct investment in the EU have been increasing rapidly, it peaked at €37.2bn in 2016 amidst a slowdown in Chinese investment globally, according to the Rhodium Group and the Mercator Institute for China Studies. In European countries outside the EU, investment also dropped in 2018. What and where is China investing? 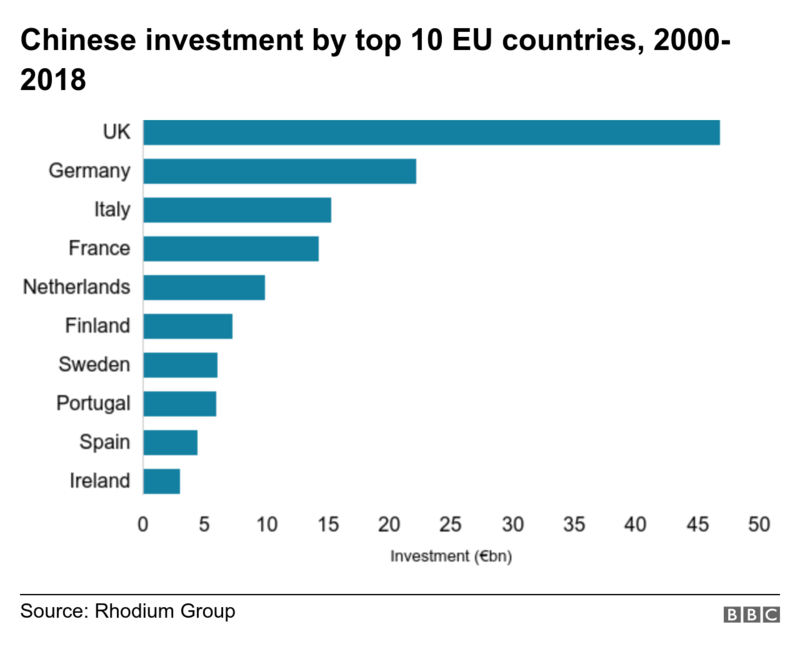 A large proportion of Chinese direct investment, both state and private, is concentrated in the major economies, such as the UK, France and Germany combined, according to the Rhodium Group and Mercator Institute. Analysis by Bloomberg last year said that China now owned, or had a stake in, four airports, six maritime ports and 13 professional soccer teams in Europe. It estimated there had been 45% more investment activity in 30 European countries from China than from the US, since 2008. And it said this was underestimating the true extent of Chinese activity. In March, Italy was the first major European economy to sign up to China’s new Silk Road programme – known as the Belt and Road Initiative (BRI). It involves huge infrastructure building to increase trade between China and markets in Asia and Europe. Officially more than 20 countries in Europe (including Russia) are part of the initiative. For example, China is financing the expansion of the port of Piraeus in Greece and is building roads and railways in Serbia, Montenegro, Bosnia-Herzegovina and North Macedonia. This could prove attractive to poorer Balkan and southern European countries, especially as demands for transparency and good governance can make EU funding appear less attractive. However, analysts point out that Chinese loans come with conditions – such as the involvement of Chinese companies – and also risk burdening these countries with large amounts of debt. Globally, China’s outward direct investment has slowed over the last year or two, after more than a decade of expansion. “This is mainly the result of stricter controls on capital outflows from China, but also of a changing political environment globally concerning Chinese investment,” says Agatha Kratz of the Rhodium Group. The Trump administration is taking a tougher line towards China’s economic activities. Governments elsewhere are more cautious – particularly when it comes to investment in sensitive areas of the economy, such as telecommunications and defence. But there’s little doubt China is now a significant player in Europe, whether through direct investments or via the new Silk Road project.